The Van Horn Hotel was a hotel constructed in 1916 by local architect Arthur Van Horn. The hotel’s construction was financed by Van Horn’s frequent business partner, Edmond Hughes. 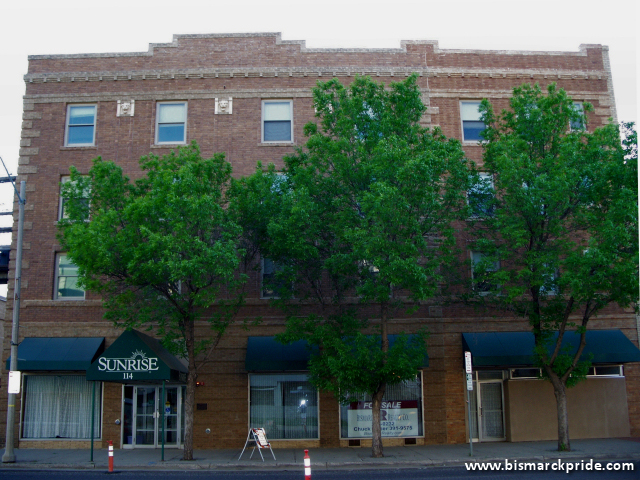 The building is located at 113 N 3rd Street. The hotel was renamed Prince Hotel in 1926 upon completing an 18-room north wing addition to the main building. The new name was chosen to honor the president of Merchant’s Trust Company, J.A. Prince. The hotel was soonafter purchased by local entrepreneur and philanthropist Neil Churchill. The Prince Hotel remained in operation until the late 1970s. It was once again renamed Kensington Hotel prior to closing. From 1999-2005, the building housed Sunrise Senior Living. The building sat mainly vacant for years until being converted into efficiency apartments in 2010. Housed within the hotel was the Blue Blazer Lounge. Shortly after it ceased being the location for Sunrise Senior Living, (I’d fathom sometime in the late 2000s), it became (and currently is) a halfway house for convicted criminals who’ve finished their sentences in county or state detention. I’m not sure, but I guess the halfway house calls itself “Grandma’s House” nowadays. I’m not sure who or what company currently owns/operates it, though. No mention of UTTC under Colleges and Universities? Anyone can attend and they have many 2 year programs as well as bachelor’s in business, criminal justice and education.